In the course of researching these boats, I had the pleasure of a few discussions with Marcus A. Hall, Jack Churchward's chief engineer who, some 50 years after retiring from his Steelcraft days, informed me that prior to his leaving Churchward in 1950, approximately (2500) 26' s, (75) 35's and only a very few runabouts were produced during the Churchward and Co. era. 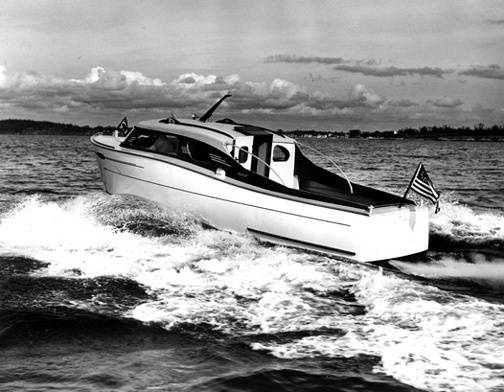 Other models may have been produced in the few years following the Churchward bankruptcy by the newly reorganized company Steelcraft Boats Inc. Anita Mason, daughter of the well known naval architect Al Mason, informs me that the original designers of the Steelcraft 35, Sedan Model, were: DAIR N. LONG and ASSOCIATES Naval Architects & Marine Engineers 35 North Raymond Avenue, Pasadena, California and that her father did interior design work on the 35' for Steelcraft Boats, Inc.. This suggests more 35' models may have been produced following the Churchward bankruptcy in 1950. Of particular interest to my research was the relationship of Steelcraft to Safticraft as some of the Safticraft cruisers of the late 40's were, with minor exceptions, near clones of earlier Steelcraft models. I later learned that Jack Churchward allowed (in fact publicly endorsed) then, Avondale Marine Ways, later the Duponts of New Orleans to use some of his designs. The result is that many more "virtual" Steelcrafts were built under the Safticraft name. A little known addition to Jack Churchward's already impressive legacy.